3 Easy ways to make your bathroom more comfortable. Three easy ways to save money on a kitchen renovation. Springtime Renovation Checklist – Are you ready for your renovation project? Do you like being comfortable in your home? Of course you do. With today’s renovations, more and more thought is being put into not only creating something beautiful, but also making your home more comfortable…and bathrooms are no exception. Here are some ideas that can easily add more comfort to your newly planned bathroom. For the longest time, choosing a toilet was a pretty basic decision. Do you want the basic, standard, 2-piece toilet or do you want the more expensive one piece toilet? 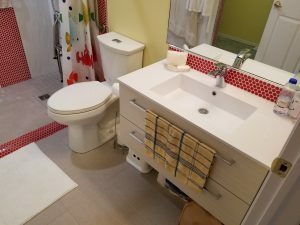 Now, there are more options that not only give your toilet a different look, but these options actually affect the level of comfort you have when…uhh…using the toilet. An elongated, comfort height toilet is a great way to add a bit of comfort to your bathroom. The first option that you should consider is choosing between a round toilet bowl or an elongated toilet bowl. Traditionally, toilets were of the round variety, however, an elongated toilet bowl is a lot easier to sit on. The only real drawback of course is they take up a larger footprint in your bathroom. In most cases, this isn’t a problem, but for small bathrooms, such as an ensuite, an elongated toilet might affect how much leg room you have, or, it may interfere with opening and closing the door. The other option that can really add a lot of comfort is the height of the bowl. Standard height toilet bowls are usually 15 inches high whereas “comfort height” toilet bowls are 17-19 inches high. Those extra couple of inches don’t sound like a lot but, trust me, if you are tall, elderly, or have mobility problems, these toilets are a lot easier to sit on. As you move to an elongated, comfort height toilet, the cost of the toilet does go up, but the amount is really insignificant. Consider removing the tub and putting in a shower with a fold up bench. This bathroom doesn’t have the pesky tub to climb in and out of. use it and would like to get rid of it. Sure, I imagine there are those folks that like to sit in the tub at the end of a long day with a glass of wine and a good book, but in reality, most people take showers. If you’re the kind of person that steps into your bathtub only to take a shower, why not get rid of the tub? More and more, it’s becoming acceptable to forego the tub in favour of a tiled shower as the main place to bathe. The tiling systems have improved enough that, if done correctly, showers aren’t prone to leaking either. The benefits of having a shower rather than a tub are many. The most obvious one, of course, is safety. 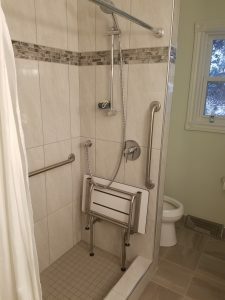 You’re not lifting you leg very high in order to get into and out of a shower whereas with a tub, it’s much easier to slip and fall while getting in or out. Showers are easier to clean as well. And, if you do need to sit down due to mobility issues, a fold down bench is a perfect way to sit and enjoy the nice hot water. Add in a rain head and it’s like sitting under a waterfall. What if I kids? Pets? Isn’t a tub easier? I really don’t think so. Nowadays, a when bathing a newborn, most people buy a smaller tub to sit in the regular tub. Now, that tub can just sit on the shower floor (or maybe the bench, although I haven’t tried that). And as far as pets go, I don’t really think there is a difference. Choosing the right product can mean less maintenance and more comfort. Larger format tiles and a shower curtain mean less time scrubbing grout lines and shower doors. 6 inch wall tile and a sliding shower door that sat on edge of the tub. If you weren’t dedicated to cleaning well, the tile and the door started to look funky after a while. The first thing you can do to combat the funk and make your life more comfortable is to choose a larger format tile. Bigger tile equal fewer grout lines which means less scrubbing. Not only that, but the current trend in bathroom tile is to go with a larger format tile. It’s common now to see 12×24 or 18×24 tile on the walls rather than 3×6 or 6×6. And, if you want to spice up the look of these larger tiles, it’s still easy to incorporate mosaic accents in the design. As well, instead of including a glass door for your tub or shower, why not go with a rod and curtain? The advantage of the rod and curtain is that it’s much easier to keep clean. When a shower door gets dirty, it often means getting down on your hands and knees with a scrub brush and spending some time removing the mildew. With a shower curtain, you can throw the thing in the wash, or, simply replace it. Come to think of it, the rod and curtain are also a lot more comfortable on your wallet. Tiling and Waterproofing your Shower: The basics you need to know. 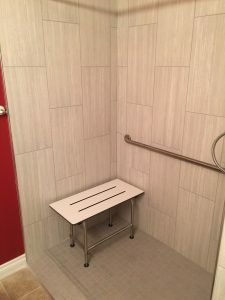 Featured Project : Aging in Place Bathroom in a Downtown Condo. Nord Alta Construction is a family owned and operated construction and renovation business serving Edmonton, St. Albert, Sherwood Park, Spruce Grove, Fort Saskatchewan and surrounding areas. Our focus, since 1979, is to provide excellent workmanship, great value, and the best possible experience you can have when working with an Edmonton construction company. © 2018 Nord Alta Construction. All Rights Reserved. We reply within one business day ! Help us locate you easier by providing your address. We don't require it though.